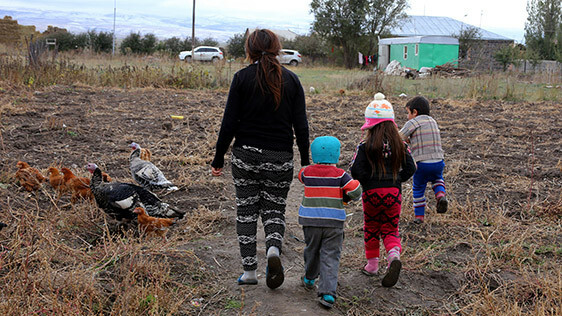 Thanks to “Let’s Keep Children in Families” charity program implemented by the joint efforts of Ucom Foundation and World Vision Armenia this month as well the Ucom subscribers have helped one more family to create their source of sustainable income. 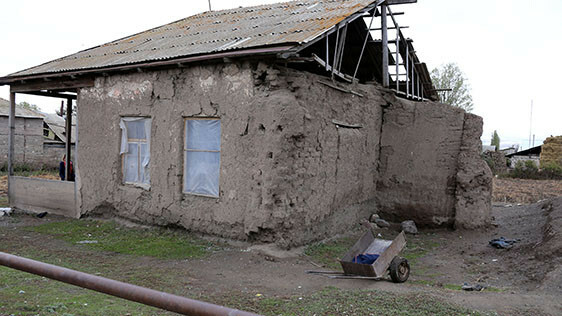 This time the support was provided to the family of Elmira – the mother of four children, living in a village community of Gegharqunik region of Armenia. As a result of the family internal problems, the mother is the only caretaker of her four kids, two out of which are schoolchildren, while 5-year-old Gor and 3-year-old Harout are permanently at home, for there’s no kindergarten in the community. This community isolated family lives in extremely difficult socio-economic conditions: they found shelter in one of the community’s abandoned soil-made one-room houses, the ramshackle roof of which was even more damaged by the wind and lets the rain pour inside the house, thus making it unsafe for habitation. In order to earn money the mother sometimes works at the potato fields, yet the only regular family income is the allowance of 49 000 AMD, which is barely enough to cover the most basic needs of four children. Within the scope of “Let’s Keep Children in Families” program, taking into account the role of breeding and agriculture for the improvement of the socio-economic conditions of the family, Ucom Foundation has provided Elmira with 50 hens, potato seeds, a washing machine, beds and bedding, kitchen utensils, wardrobe and warm clothing. In addition, the Vardenis Regional Program of World Vision has provided a cabin-wagon to the family. All these will help solving the food problem to some extent and generating some income. Elmira is convinced that now she will be able to satisfy the most basic needs of her family and to keep her children home under the maternal care. “Ucom Foundation doubles the amount donated by Ucom subscribers on a monthly basis, which makes it possible to carry our this project with the help of World Vision. They find and work with these highly vulnerable families living in extreme poverty, and thanks to our customers these families receive minimal opportunities to meet their basic needs”, - said Ashot Barseghyan, the director of Ucom Foundation. “Together with Ucom Foundation we implement a program, that allows us to satisfy the basic needs of the families striving in the severe conditions of extreme poverty, and create the possibility of stable income, which allows such families to keep their children home or return from the boarding establishments”, - said Artak Ordyan, the head of marketing at World Vision Armenia.